I created Let's Go Birding because I have a passion for birds and the environment. I have been teaching bird watching classes for over a decade and enjoy working with people and introducing them to the avian world. Let's Go Birding is able to provide opportunities for the beginning/intermediate adult birder to go birding in a relaxed, informative, non-intimidating atmosphere. Along with having a lot of fun, people get to visit incredible places while increasing their birding skill level. As a child, I remember class field trips were the high light of each school year. Well, adults are just big kids and we still like to go on field trips! Through my field trips people find "Life Birds", capture fantastic photographs and make new friends. Through classes and field trips I am also able to support other organizations dedicated to the environment. Let's Go Birding is able to contribute to many of the areas we visit and proceeds from classes also go back into the organizations sponsoring the event. It is a joy to work with people and to see their faces when they see an incredible bird for the first time. I believe the more people learn about birds and connect with nature, the better chance the birds will be here for future generations. Lisa is a south Bay Area, California native. As a child, Lisa enjoyed everything related to nature. opportunity to develop the exceptional organizational and customer service skills Lisa uses today in leading birding tours. area Audubon groups. Private and small group birding adventures can also be arranged by contacting Lisa directly at lisa@letsgobirding.com. many organizations dedicated to environmental awareness & education. 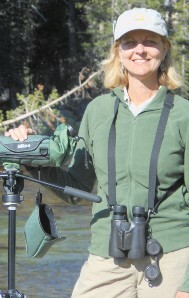 Lisa is currently transitioning over to become the owner of the Los Gatos Birdwatcher. This December 2015 owners John & Freddy Howell will retire after twenty years of successfully running their store and bringing the bird world to our local community. Let's Go Birding will continue as the birding tour division of the Los Gatos Birdwatcher.